I made this card for a young couple who had another boy. I used a stamped HOUSE MOUSE image I recieved in a recent HOUSE MOUSE stamped image swap I participated in. I knew as soon as I received it that it would be perfect for a card I've been wanting to make. I don't have many baby images, stamps or supplies in my stash so I had been a little stumped & slow @ getting a start on making a card for them. I used a premade Kraft card & envelope to start. I colored the image with copic markers for just a hint of color. I used a pink/flesh tone to color the nose, mouth & inside of the ears. Grey was used for the outside of the ears & add a little shadow to various points on the shoe. I used blue patterned paper with baby themed words & sentiments. 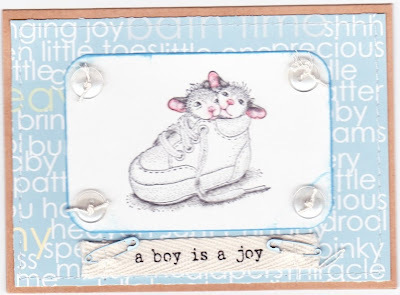 I stitched around the outside edge & also stitched on a printed cotton twill ribbon with the sentiment 'a boy is a joy!' To this I added a tiny blue diaper pin to either side of the ribbon. I lined the inside of the card & envelped with this patterned paper. 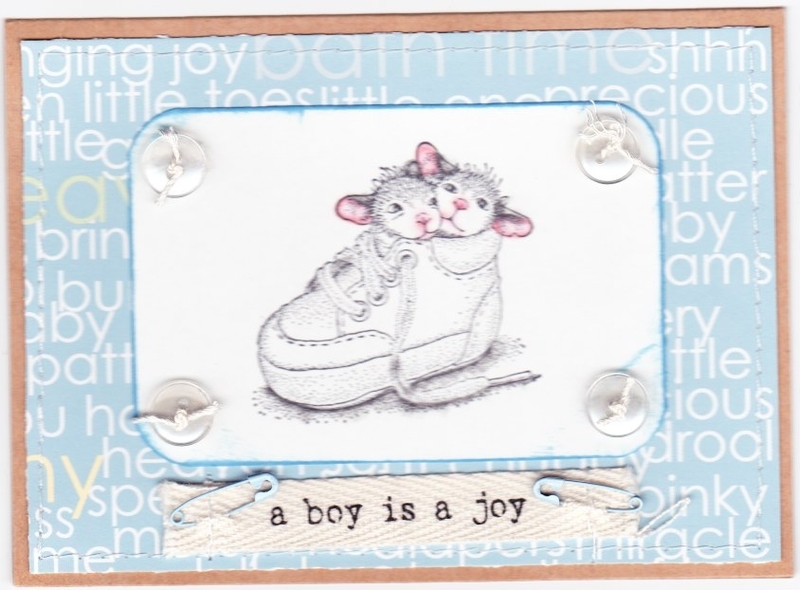 I also stamped 'It's a Boy!' on the outside of the envelope. In the end I was pleased at the way this card turned out.